Olentangy’s Mitchell Postak (9) picks up a block during the first set of Tuesday’s showdown against visiting Mount Vernon. The Olentangy boys volleyball team started well and never looked back, rolling to a three-set win over Mount Vernon in Tuesday’s home opener. 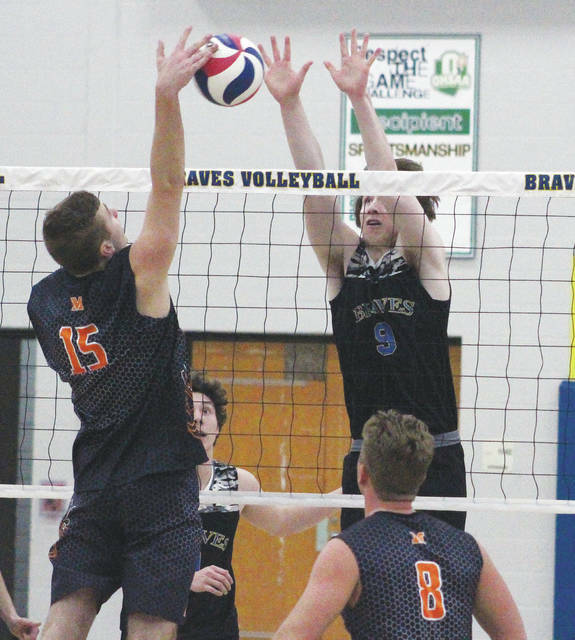 The Braves (1-1) scored the first five points on the way to a 25-18 opening-set win. They won the second 25-15 and the third 25-20. Aaric Gossett and Hayden Kerekes led the charge with eight kills apiece, Jack Spohn and Kerekes each had three solo blocks and Bentley Azbell joined Kerekes with seven digs. The Pioneers picked up their first win in program history Tuesday … and it took them just one game to get it done. Orange, competing in boys volleyball for the first time this season, won the first two sets of Tuesday’s opener by respective scores of 25-22 and 25-23. Briggs bounced back with wins of 25-22 and 25-20 in the third and fourth, but the Pioneers stepped up in the fifth, winning 15-9 to seal the deal. Luke Little led the way with 14 kills, five blocks and seven aces while Lawton Hinley had a team-best 22 digs in the win. Garrett Runyon also had a nice night, adding four kills and 12 digs. Austin Krinn scored what proved to be the game-winning run on a passed ball in the top of the seventh inning as Big Walnut slipped past host DeSales 8-7 Tuesday in Columbus. The Golden Eagles (1-1), down 7-5 heading into the final frame, scored three times to turn the tide. Krinn and Cale Sherbourne connected on RBI singles before the passed ball. Krinn, Jackson Seiple, Connor Gerren and Nathan Lawyer each had a pair of hits in the win while Krinn, Jake Foster and Gerren collected two RBI each. Krinn picked up the win on the mound as well, tossing four innings in relief of starter Colton Lee. He allowed a run on three hits while striking out four. The Patriots scored early and often in their season opener, plating seven runs in the second on the way to a lopsided win over St. Joseph by the Sea Tuesday at the Ripken Experience in Myrtle Beach. Corbin Parrish had the big hit, clearing the bases with a three-run triple. Carson Comer was solid as well, finishing with two hits and an RBI. He also scored a run and stole two bases. The win was the first of two as Liberty blanked Butler 8-0 later in the day to improve to 2-0. Also: Wheaten North 3, Olentangy 2; Olentangy 9, Lake Forest 1. Sophie Low was sharp in the circle and Olivia Davidson got it done from the plate as Olentangy notched a 4-1 win over David Crockett (TN) Tuesday afternoon. Low tossed all seven innings to collect the complete-game win, allowing an unearned run on two hits while striking out six and walking two. Davidson, meanwhile, had three of the Braves’ eight hits. Olentangy also picked up a win earlier in the day, outlasting Olmsted Falls 9-6. Teresa Hawk and Brenna Oliver connected on two hits apiece, but Choctawhatchee erupted for a nine-run sixth to all but seal the deal Tuesday in Destin, Florida.